A] Episcopal Church parking lot NW corner of Old Orchard and grove. B] US Post Office parking lot, SW side of PO. Street is Civic Center. C&D] Business lots with good views[?]. W] Vhere der Wienerschnitzel vas [Main St; Hwy 1171 exit from I-35E]. Now kaput! No sign; empty building. S&S] Sack & Save grocery. The new apartments on Old Orchard are gated, as are the older ones to the north s. of College Pkwy. The wooded area used to be the center of the roost; now apartments. No parking on Old Orchard, or s. side of College; OK on n. side. The center of the roost looks to be roughly in the purple circle, but may extend north of College. I shot video from A & B between 8:31 and 8:47PM CDT. 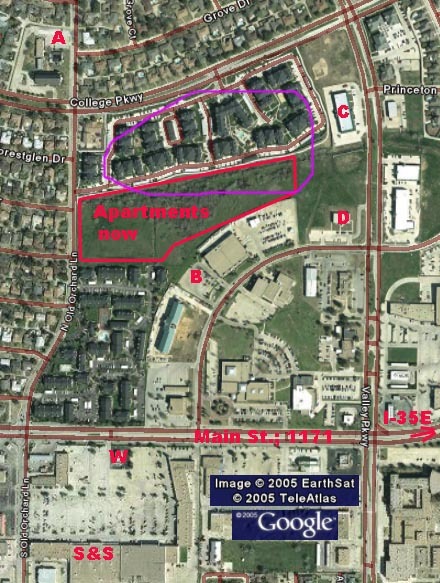 The area shown is about one mile west on Main St./Hwy 1171 in Lewisville, TX, between Dallas and Denton. The graphic is an edited screen shot from the excellent free program for hi-speed [DSL/Cable Modem] Google Earth. To find the 10Mb free download, Google "Google earth". Video shot 26 July. Looks much better in person. Dailup estimated download time 20 minutes; DSL or Cable Modem under 1 minute.